We’ve all heard of unconscious bias, but how many of us know the ins and outs of what prejudices that we act on daily? Without realising, our attitudes towards other people can by influenced by our feelings as well as our rational thought processes. While unconscious biases are natural and unintentional, that doesn’t mean we shouldn’t be taking steps to overcome it. 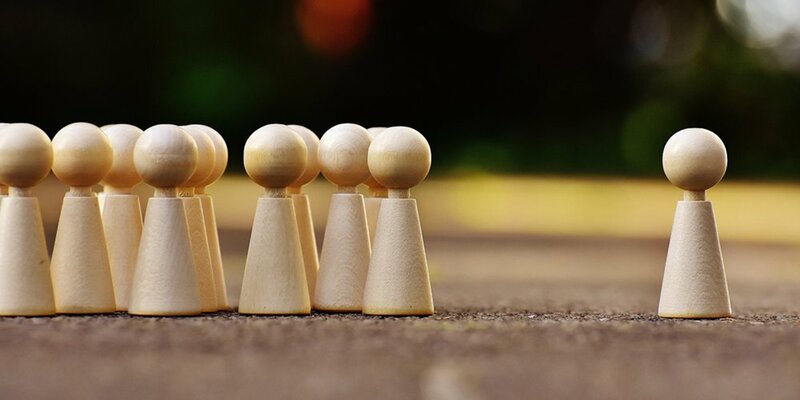 It’s no secret that diversity has a positive impact on an organisation, with many statistics that show the most diverse organisations are the most successful ones, but the presence of unconscious bias in the recruitment process can lead to a less diverse workforce. The starting point for addressing the bias present in your hiring process starts with identifying the most common types to make you more aware that unconscious bias does exist. Affinity bias occurs when we unconsciously favour someone who shares similar qualities to ourselves or someone we like. We see them as familiar and relatable, and it’s natural for us to want to be around people we relate to. For the best cultural fit, businesses should aim to recruit people who share a similar vision and goals. It’s important to understand the difference between this and affinity bias – just because someone has similarities to us, doesn’t mean they’re the best cultural fit. We should consider ways of testing which identifies cultural fit. Here at Shine, we’ve developed values-based recruitment that does the work for you, to help you find the candidates whose values align with your organisations by benchmarking your current culture profile. This affects how we assess other people. It’s all to do with the way we perceive the actions of others, as the standard perception is that when a person does something well, it’s because they’re lucky, but if they’ve done something badly, we think it’s due to their personality or bad behaviour. To avoid attribution bias in your recruitment process, try using behavioural and situational questions to determine capabilities and suitability for the role. Try to be aware that their successes and failures are caused by a variety of different factors – and make sure you ask the right questions to figure this out. It’s impossible not to notice a person’s appearance and associate it with their personality – even if we don’t realise, we’re doing it. Every day we make assumptions based solely on what we can see. While appearances are important in the workplace for professionalism and self-awareness, many of us judge harshly on our perceptions of physical attractiveness. Enter blind interviewing. On the Shine platform, you can review and share video interviews and optionally hide the video so that it’s audio only. Doing this will remove any preconceptions about a candidate based on their appearance, so that opinions are based on their answers alone. Many of us are programmed to want to fit in. Because of this, our views and opinions are swayed by other people as we try to conform with the group. This is common in situations such as panel interviews where opinions about candidates will be influenced, as well as behaviour in the interview, depending on how the rest of the panel are perceiving the candidate. It’s said that 75% of people will scrap their own opinion just to match the rest of the group. When you use video interviews in your recruitment process, your panel don’t have to be present at the same time and multiple people can rate and review candidates through the Shine platform. Each candidate receives an average scored based on each interviewer’s preference – doing this in their own time away from other reviewers will reduce the impact of opinions being swayed. If needed, you can also set preferences for blind mode settings to appear to each person reviewing the interview, to remove any prejudice you think may be present. We all form an opinion about a person within the first few seconds. Confirmation bias occurs when a person will search for evidence which back up their opinions, because they are looking for confirmation that their initial assessment was correct. The danger of conformity bias in recruitment is that our own judgement could be very wrong, but we’re distracted by searching for that evidence. There are several ways that you can overcome confirmation bias in your recruitment. When using video interviews your questions are standard for each candidate – these cannot be altered by a recruiter looking to confirm their initial assessment. You should also make sure you’re asking the right questions to gauge specific skills and traits you’re looking for, as it forces the interviewer to assess the candidate on questions directly related to the role. Blind mode can also be used as a helpful tool here as removing both the video and the candidate name, if necessary, will reduce any pre-judgements made about a candidate and therefore recruiters spend less time in confirmation bias mode. The halo effect occurs when we focus on one particularly great feature about a person. Say a candidate went to a highly rewarded college and received a high grade, we’ll look at everything else about that person surrounded by the glow of that achievement. This can make us overlook information about a candidate that might imply they wouldn’t be the best fit in your organisation. Using a collaborative approach for the scoring of video interviews can stop the halo effect from happening. The combination of blind mode and a diverse recruitment team will stop the halo effect from having a negative impact, because we can receive feedback on candidates based on their video interview alone, not what’s on their CV. The scoring also gives candidates an overall average based on their marking from different reviewers, so even if there is a slight halo effect in one of the recruiters this is likely to be averaged out amongst the other scores. This is the opposite of the halo effect. This occurs when we focus on one negative aspect about a person, even as simple as a characteristic that we don’t like. If we make negative assumptions about candidates, everything else in the interview will be clouded by this judgement and we miss the points that reflect on how they will perform in the role. Like that of confirmation bias, using blind interviewing will reduce the chances of creating negative perceptions about a person. We’re unable to see most of their characteristics so there is little that can cloud our judgement. Each video interview will also have a standardised set of questions which are the same for every candidate, meaning that even if the horns effect happened to be present, it wouldn’t affect the candidates experience. But it’s called ‘unconscious’ bias for a reason, right? You’ll never find one person who is completely aware of all their thoughts, and you’d be lucky to find someone who doesn’t have a negative opinion towards certain stereotypes. 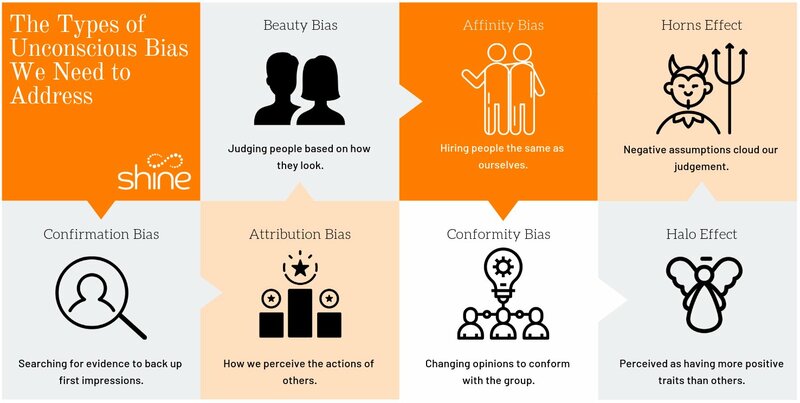 Overcoming unconscious bias will start with the training of your team to make them aware of the types of bias, as they’ll then be much more likely to notice any of these behaviours if they occur. Here at Shine we can offer you solutions that offer a consistent interview standard to each of your candidates, with features designed to battle unconscious bias and foster diversity in your organisation.